If you bring a non-HOG Member, please indicate this with your registration. Due to popular demand we will be returning to the cool tranquil surroundings of the Cameron Highlands with HOG on Saturday 26th May through to Tuesday 29th May 2018 – 3 nights, one more than last year! From your first lungful of fragrant highland air, sweat and stress evaporate. 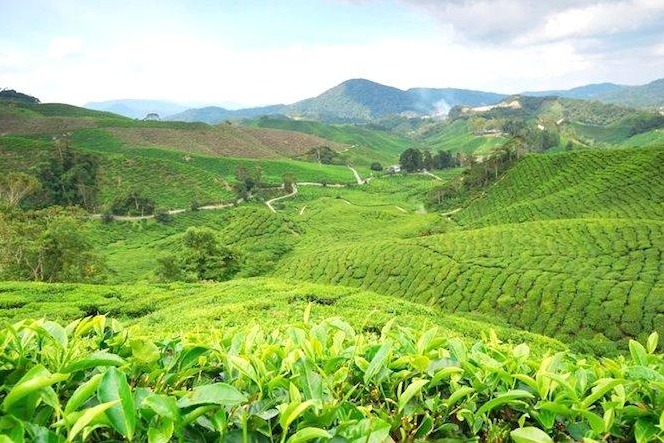 In Malaysia's largest hill-station area, the breeze is freshened by eucalyptus, fuzzy tea plantations roll into the distance, and strawberry farms snooze under huge awnings. Named after explorer Sir William Cameron, who mapped the area in 1885, the highlands were developed during the British colonial period. Gardens, bungalows and even a golf course sprang up during the 1930s, making the Cameron Highlands a refuge from the heat and a chance to relax. Temperatures in these 1300m to 1829m heights in April/May average a high of 23°C, and a low of 16°C – so a long sleeved sweater might be a requirement in the evenings. This fresh climate will inspire you to pick strawberries and enjoy afternoon tea. Push off will be early Saturday morning from GP from where we will ride towards Ipoh and turn right to head up into the plateau to our hotel, the Strawberry Park Resort, close to location of “Moonlight” bungalow; the scene of the mysterious disappearance of Jim Thompson in 1967. There will be welcome drinks upon arrival, and wet towels to “de-grime”. For the two days at Strawberry Park Resort we will have the opportunity to go on ad-hoc rides to explore the area; a trip to the Blue valley, a round trip to explore Fraser’s Hill area? These options can be discussed and decided when we get there. For those who did not make it last year, Strawberry Park Resort is a boutique hotel tucked away in the countryside of Tanah Rata, hidden among the hills and rainforest about 3km away from town. The hotel offers luxury accommodation furnished in contemporary style and we have made reservations for the studio rooms. All rooms feature an exceptionally spacious environment with satellite television, wifi Internet access, plush beds, attached bathroom and private balcony. Facilities at the resort include restaurants, meeting rooms, sports courts, boutique spa, sauna and indoor swimming pool. The hotel also offers a number of local tours that can be organized from countryside tours, forest walks. 4x4 trails etc. Details of the hotel facilities and tours can be found at http://www.strawberryparkresorts.com/. The studio rooms are available with either a king size bed or a twin room with 2 single beds. Included in the package will be 3 nights’ accommodation with breakfast, and a BBQ buffet dinner held on the verandah on Sunday evening at 7:00 pm, complimentary for HOG members, non-members S$30 per person. All other meals (except Breakfast, which is included) will be at your own expense.